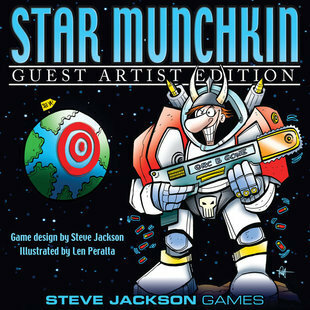 We're very proud to announce that Star Munchkin Guest Artist Edition is now available for pre-order in Warehouse 23! It's time to fire your lasers with all new art from Len Peralta, the man behind Geek A Week trading cards and Munchkin The Guild. We had an amazing response with advance copies at PAX South, where we demoed the game and sold out of our entire 24 copy supply in less than a day! This is a limited edition version, so make sure you contact your Friendly Local Game Store, or Warehouse 23 if you don't have one, to reserve your copy. 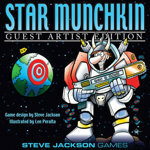 While you're there, grab a copy of Ian McGinty's Munchkin Guest Artist Edition. Supplies are limited, and it's almost sold out as well!